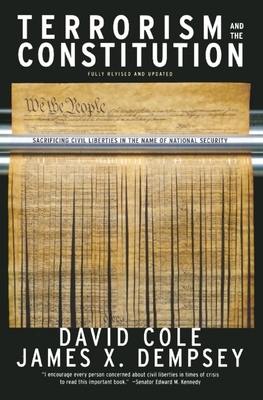 Tracing the history of government intrusions on Constitutional rights in response to threats from abroad, Cole and Dempsey warn that a society in which civil liberties are sacrificed in the name of national security is in fact less secure than one in which they are upheld. A new chapter includes a discussion of domestic spying, preventive detention, the many court challenges to post-9/11 abuses, implementation of the PATRIOT ACT, and efforts to reestablish the checks and balances left behind in the rush to strengthen governmental powers. David Cole is the George Mitchell Professor of Law and Public Policy at Georgetown University Law Center. He is also a regular contributor to the New York Review of Books and the legal affairs correspondent for The Nation. He is the author of No Equal Justice: Race and Class in the American Criminal Justice System, the American Book Award-winning Enemy Aliens: Double Standards and Constitutional Freedoms in the War on Terrorism, and The Torture Memos: Rationalizing the Unthinkable and is a co-author (with James Dempsey) of Terrorism and the Constitution: Sacrificing Civil Liberties in the Name of National Security and (with Jules Lobel) of Less Safe, Less Free: Why America Is Losing the War on Terror, both published by The New Press. He lives in Washington, D.C. James X. Dempsey is executive director at the Center for Democracy and Technology and former assistant counsel to the U.S. House of Judiciary Subcommittee on Civil Constitutional Rights.